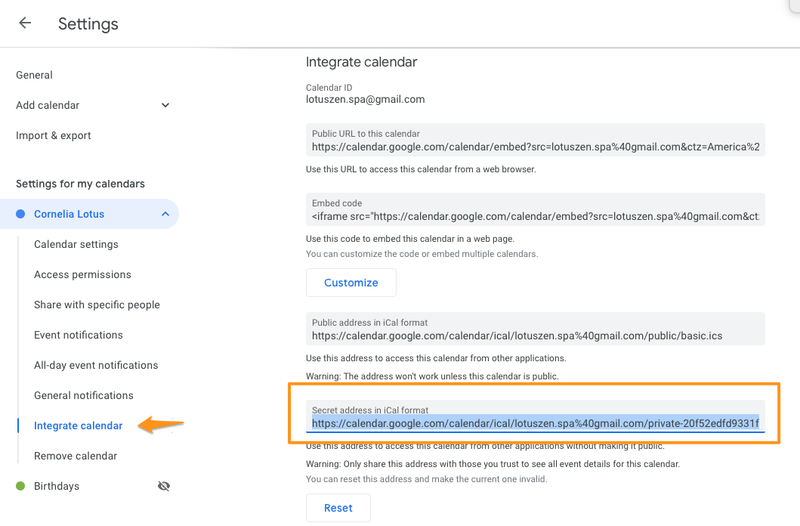 Learn how to subscribe to your Genbook Calendar in Google Calendar and how to subscribe to your Google Calendar in Genbook. 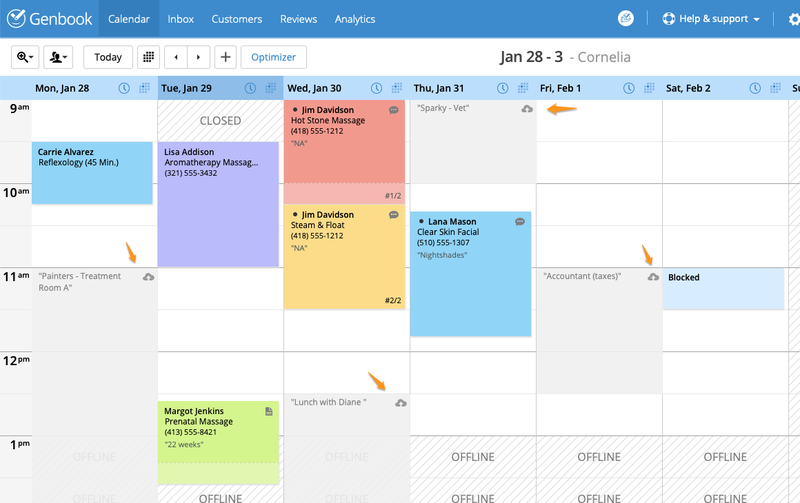 Have both your Google Calendar and your Genbook account open, preferably in the different tabs of the same browser window. In Genbook, navigate to Settings > Staff, and click on the name of the staff member for whom you want to set up sync. Then, click on "Calendar syncing". In Google Calendar's left sidebar, click the three dots beside the name of the calendar to which you want to subscribe in Genbook. Then choose "Settings and Sharing". On the next screen, click "Integrate Calendar" and then highlight and copy the full "Secret Address in iCal Format"
Back in your Genbook account, under the INBOUND heading, check the box beside "Synchronize your personal..." and then paste the URL you just copied from Google into the open field below it. Click the "Save Changes" button. 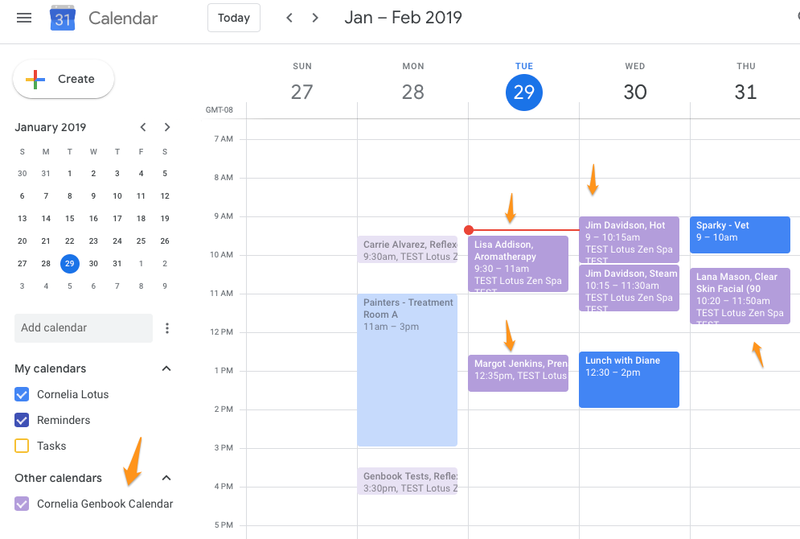 Once the initial sync and import are complete, you should see your Google Calendar appointments appear in your Genbook calendar as a light grey overlay with a little "download from the cloud" icon at the top right. 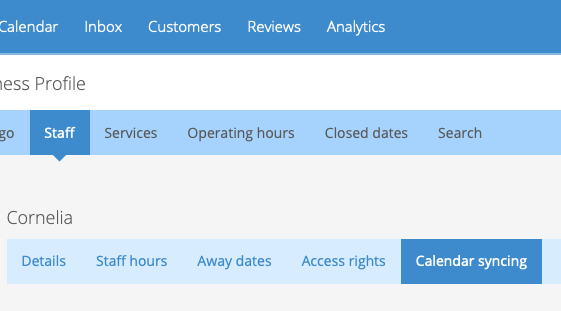 Clients will not see or be able to book times that have events from an imported calendar over them. 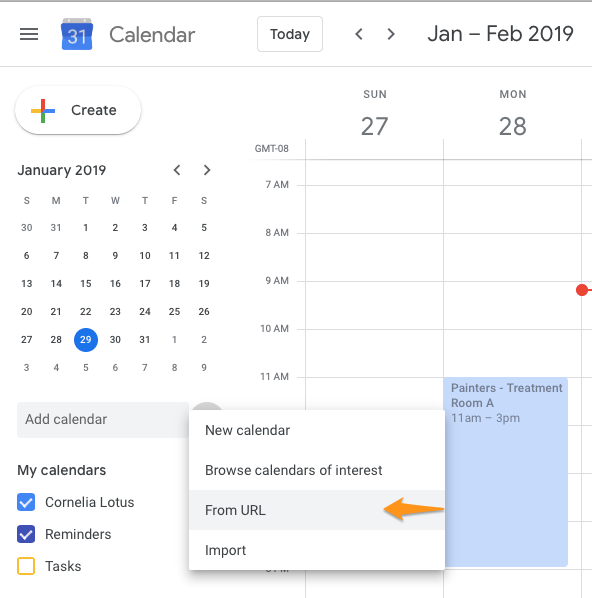 Changes you make in Google Calendar will update on your Genbook calendar in about one hour or so at any given time, as the feed is refreshed every hour. 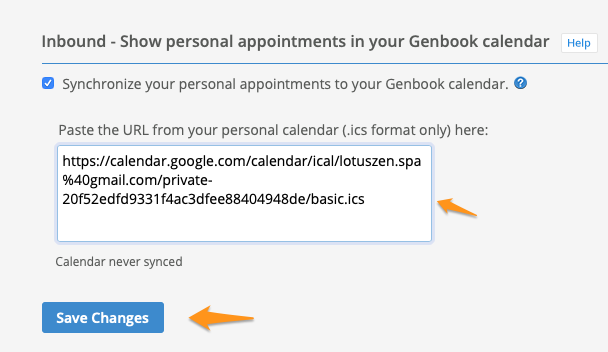 In Genbook, navigate to Settings > Staff and the name of the staff member for whom you're setting up a subscription in Google Calendar. Then select "Calendar syncing" as above. Under the OUTBOUND heading, check the box beside "Synchronize your Genbook...", then choose the "Use a private URL" option. 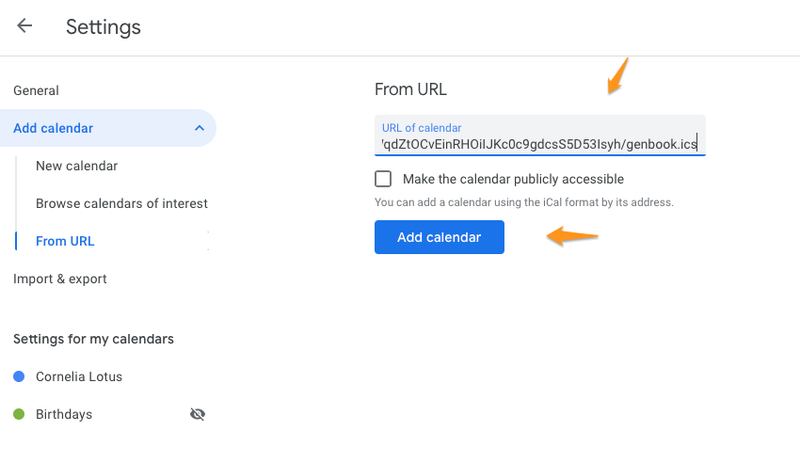 It is very important to scroll to the bottom of this page and click "Save Changes" after you've generated the URL (or if you generate a new URL at any point), before you try to subscribe to the calendar. 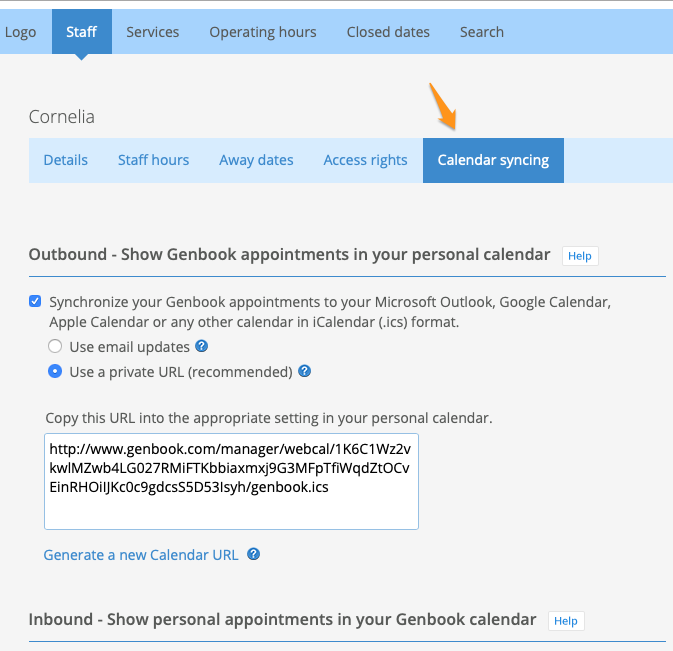 Once you've saved the new Outbound sync setting, highlight and copy the URL. Then, in your Google Calendar, click the 3 dots beside "Add Calendar". Select "From URL" from the resulting dropdown menu. 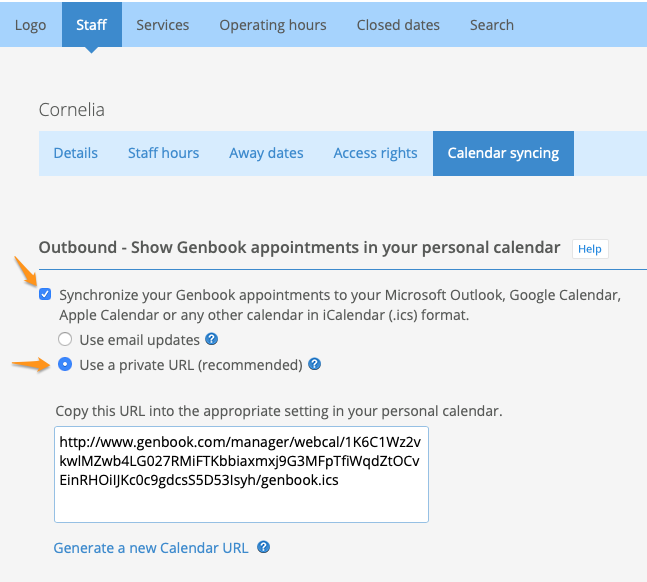 In the slot provided on the next page, past the calendar syncing URL you copied from the Outbound section in Genbook. Then click the "Add calendar" button. 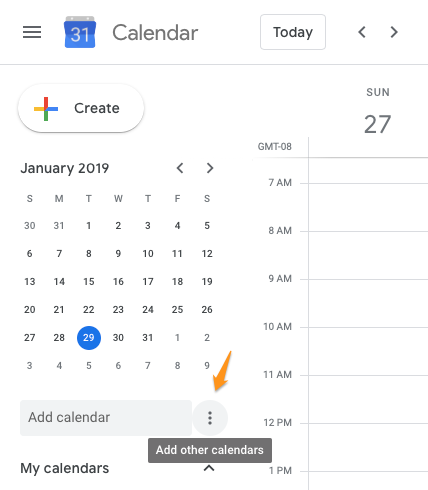 Within a few moments, the subscription to your Genbook calendar should appear on your Google calendar (hit the back arrow at the top left of the screen, beside Settings, to get back to the calendar display). 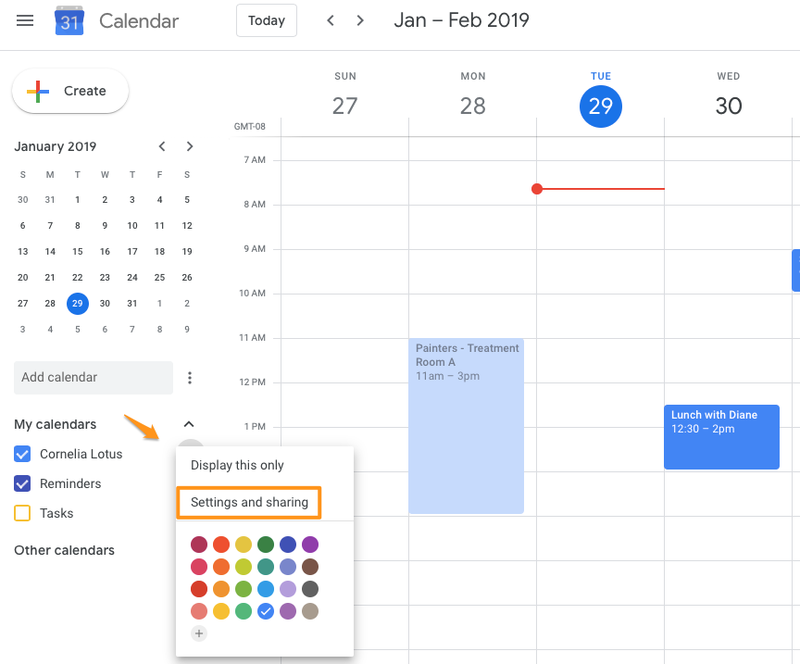 If you'd like to edit any of the synced Genbook calendar's settings in Google (the color scheme or the name of the calendar, for instance), just hover over it and click the three dots, then choose "Settings". 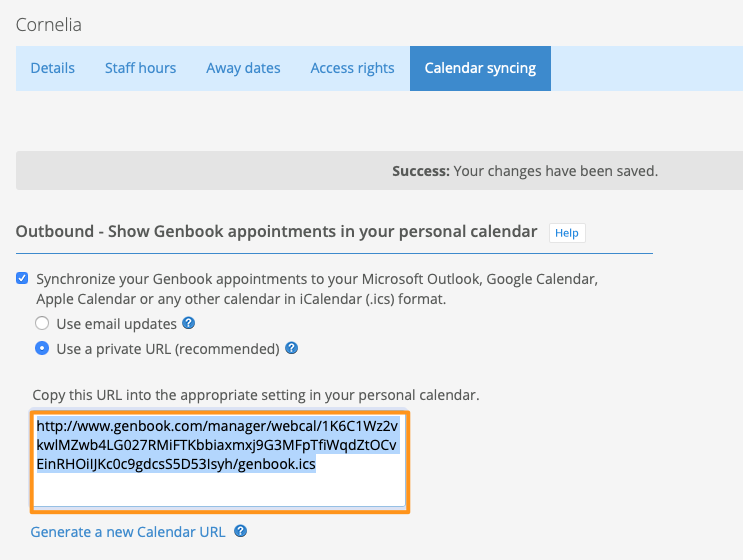 Changes you make to your Genbook calendar may take a few hours to appear in or update Google at times, as the feed is refreshed periodically throughout the day.